Joyce St. Clair has worked with clay since asking her high school art instructor if making pottery is ‘really something people can do with their lives’. Born and raised in Bedford, TX she received her BA in Interdisciplinary Art and Design Studies and BFA in Ceramics from the University of North Texas in 2011. Pursuing a greater understanding of herself as an artist and educator, St. Clair enrolled in the MFA program at Wichita State University under Ted Adler and Brenda Lichman and was fortunate enough to study contemporary art in Japan, Australia, Cuba, Mexico and New Zealand while in the program. After graduating from Wichita State with her MFA in 2014, St. Clair moved with her fiancé, Lars Voltz to Shawano, Wisconsin where he apprenticed with artist Simon Levin. 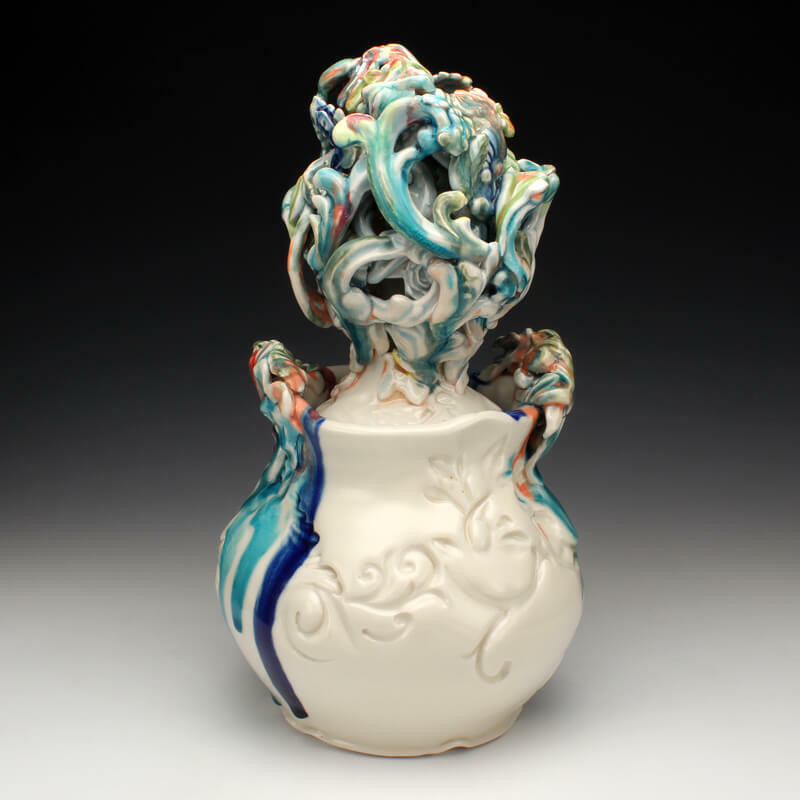 St. Clair was named one of Ceramics Monthly’s Emerging Artists of 2015 and was fortunate to be one of the Red Lodge Clay Center’s 2015-2017 Long Term Residents. She is currently a Resident Artist at the Iowa Ceramics Center and Glass Studio in Cedar Rapids, Iowa. I believe in the celebration of a robust femininity. The exchange between volume and ornament, delicacy and substantially distinguishes the relationship between culturally persistent ideals of femininity and what I understand to be my own sense of the feminine. A robust femininity informs the relationship between form and surface in my work. Robustness conveys strength through fullness and power; femininity is womanliness yet culturally synonymous with fragility and grace. My ideas of robustness and femininity are pushed and pulled in the surfaces and decorations of stout voluminous forms. Embedded and sprigged ornamental gestures emerge and converge with regulated thrown lines to create undulating, chunky curves. Powerful flowing colors connect the surface to the form through depth and decoration and provide an indulgent intensity through glistening, thick rivulets. My pottery personifies an identity that is not characterized by fragile objects of cultivated beauty but rather is proclaimed by substantial pots that recognize a genuine joy in a robust femininity deserving of celebration. In celebrating the duality of what is robust and what is feminine through generous forms and embellished surfaces, I am taking advantage of the history of Rococo era decorative and utilitarian porcelain from 18th c. Europe and its relationship to the feminine identity. Porcelain china is layered with denotations of class and materialism; the 18th c. heralded a time in which the definition of femininity became tied to a woman’s pattern of consumption. Porcelain china served as a metaphor for the female condition, and the ‘depth’ of a woman was related to decorative objects and surfaces. The Rococo era style of decoration reinforced the relationship between sumptuousness, fragility and femininity that persists contemporarily. I am manipulating the language of porcelain pottery by employing exaggerated volumes and gestures to convey the material’s strength and durability as opposed to delicacy. The generous use of clay, glaze and decoration contrasts the historical cultivation of refined, delicate porcelain. The forms are plump and dense, the glaze saturates in both color and form and the decoration merges with the body to create thick impressed physiques. Pottery provides a generous utility and luxurious history to create a language with which to explore qualities of robust femininity. Striking at the ideas of what is definably feminine, visually feminine, and my personal sense of the feminine, my pottery is my unapologetic desire for a substantial understanding of feminine identity separate from social and aesthetic dogma.